The Honor 7X is the new mid-range device of the successful online Huawei daughter. Now last week the Honor 7C was launched with face release, the richer equipped Honor 7X cannot be left behind. The attractive smartphone for the middle segment will, therefore, receive an update that will unlock face recognition. The successor of the Honor 6X was launched in December of last year and has been for sale in the Netherlands for some time. The device has the rich equipment, and you unlock the phone via a fast fingerprint scanner. This will be easier even later thanks to the new Face Unlock option. With a new update (OTA version) facial recognition will be implemented in the Honor 7X. After Apple has launched the iPhone X with only Face ID, there is an emphasis on face unlocking in the smartphone market. Huawei's variant is called Face Unlock and was first offered at the Honor View 10. A few days ago a budget device was launched with Face Unlock. The more expensive Honor 7X stayed behind in this, until now. 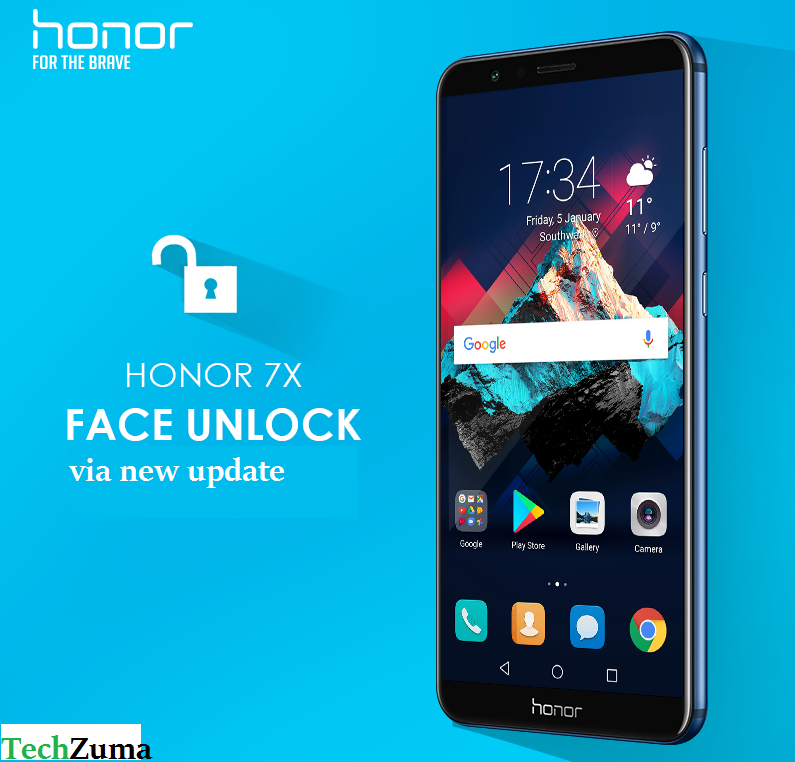 Huawei has announced a new update for the Honor 7X with which you also get Face Unlock. According to the Chinese manufacturer, this update will be completed by mid-March. The fast mid-range smartphone has been sold separately for some time or through an Honor 7X subscription. There are some reasons why you would choose this phone. First, the device has an excellent price-quality ratio. The 5.93-inch display takes almost the entire front and has a large resolution of 1080 x 2160 pixels. Within this metal device, you will find the powerful HiSilicon Kirin 659 octa-core processor. The processor has clocked four Cortex A53 cores at 2.36 GHz and 4 Cortex A53 cores clocked at 1.7 GHz. Also, there is 4 GB of memory and 64 GB of storage space. You can get more storage with a microSD card up to 256 GB. A hefty 3.340mAh battery provides power, and Android 7 is the operating system.